This record is a mystery… It’s basically a collection of Disco version medleys of songs by artists like San Ul Rim and Ham Jung-A. It’s so odd that it has a charm of its own. The music – and the concept itself – is not too all that dissimilar to the Non-Stop Music records by The Stylers and The Travellers of Singapore. Just one major difference – this record has no mention of the artist(s) anywhere on it. If you have any information about this record, please contact me or leave a comment. Most of Asia had an astonishing musical history throughout the 60s and 70s, producing mind boggling combinations of music that were the result of traditional and modern influences. And luckily, many of the fruits (i.e. – records) of these ‘chocolate-in-my-peanut-butter’ moments can readily found online. But of all of the countries of Asia, two drive me completely nuts – The Philippines and South Korea. Both of these countries apparently got the worst music of the Western world. The Philippines got New Wave and South Korea got Heavy Metal. Now, don’t get me wrong, I loves me some cheesy synth pop or the occasional head banging… But the majority of what I see from both of these countries has been re-issues of stuff either like Gene Loves Jezebel or Helloween. Now both of these countries had amazing music histories, but finding copies of those records has been rough. Kim Choo Ja (also seen as Kim Chu Ja and Kim Chooja) was born January 2nd, 1951. On her first album, she was backed up by Shin Joong Hyun (also seen as Shin Jung-hyeon and Shin Jung Hyun) and his band The Men. She went on to become one of the most popular vocalists of the 70s and recorded well into the late 80s. Unfortunately, I have not been able to translate her biography on her website (and online translators do very bizarre things with the Korean language). Catalog number KLS-55 on Universal Record Co. of South Korea, released 1973. I’ve recently come into a lot of free time… So, I’ve been catching up on some reading, finally delving into some books on the subject of world popular music. I decided to start with Peter Manuel’s Popular Musics of the Non-Western World: An Introductory Survey. And while it does remind me of why I never read the assigned text books when I was in college, it has made me question how I quantify what it is about the music that I like – and post here. Much has been written about the distinctions between folk, classical, and more recently, popular musics. It is often easy to regard such discussions, whether justifiably or not, as gratuitous exercises in abstract taxonomy, and it is clear that they are generally of more import to musicologists than to performers or audiences. Nevertheless, world musics often do lend themselves to broad, if occasionally ambiguous taxonomies, the clarification of which helps us to understand the nature of these genres in terms of the attributes they share or do not share with others. Moreover, many cultures themselves do distinguish between folk, art, and popular music styles. Hence such categories often can and should be employed as “-emic” constructs in understanding ethnic music from the perspective of its own culture. What should be avoided is not the use of clearly defined classifications, but rather the tendency to attach ethnocentric, class-centric, or idiosyncratic values to such concepts. At the same time, in order to understand the relationship between these different kinds of music, one must define the underlying, generally unarticulated criteria which distinguish them. Clear as mud, right? It seems like when dissect something to death, you take all of the fun out of it. What I came away with after reading the first chapter is that there is no real clear definition. And really, to me it seems almost pointless. I just know what I like. For example, I love the raw Afro funk from Dahomey like Orchestre Super Jheevs des Paillotes and Orchestre Poly-Rythmo. The labels that released those records were similar to the small Punk and Indie of the 80s and 90s. They were putting out bands that recorded live to two track – sometimes recorded at someone’s house – and released as singles in limited quantities. I’m sure that the person who released the record expected to made some money – but nothing on the scale of the Bollywood music industry. And I really enjoy that stuff as well. But Bollywood music is probably the most commercial most ever created. And the Steel Guitar versions are practically the muzak of India. So what is it? Well, I’ve narrowed it down to three major “rules”, for a lack of a better term. First is geography. This was just an arbitrary decision. At the time, I decided to leave out South America, mainly because I thought I had heard all that there was to hear from that region… And I was wrong. I keep debating whether or not to start adding music from South America, but then I’d have to redesign that map at the top of the page… And I really don’t need a reason to not buy more records. Second is the use of electric instruments. This is not to say that I do not like songs with all acoustic instrumentation. It’s just that I tend to prefer songs with electric guitar or organ. Better yet, is when an instrument that usually is not electrified is hooked up to an amplifier – like an oud, saz or, of course sitar. This is usually the result of the Folk Tradition being mixed with urban development. And it seems like you rarely hear this in more modern music, due to new technologies. Which brings us to rule number three, which is a bit harder to define. But due to synthesizers and groove boxes, I tend to stick to the “Pre-digital age” production. There is a narrow window of time between the introduction of the electric guitar and the onslaught of the synthesizer. It seems like in some regions – like say some parts of Northern Africa – where that was only a matter of four or five years. But rules are made to be broken. The song that I posted by Mayada doesn’t have any electric instrument. And the song Rahbaniyat by Omar Khorshid has some kinda of crazy sequencer going on in the background. It all really boils down to just taste. Catalog number K-APPLE 819 on Universal Records of Seoul, South Korea. Released 1976. Korea is one of the oldest continuing civilizations in the world, founded in 2333 BC by the legendary Dangun according to Samguk Yusa. The Korean Peninsula was first inhabited as early as the Lower Paleolithic. Following the unification of the Three Korean Kingdoms under Silla in AD 668, Korea went through the Goryeo and Joseon Dynasty as one nation until the end of the Korean Empire in 1910. After division, South Korea was established in 1948 and has since developed a successful democracy, maintaining a strong alliance with the United States and its allies. South Korea is now working towards a peaceful reunification with North Korea. There’s not a whole lot of information available about the early days of rock ‘n’ roll in South Korea. Despite having a lengthy article on “K-pop”, Wikipedia has only a brief mentions of “T’ong Guitar” and “Norae Undong”. The Key Boys would fall in to the latter category. Most of the information that can be found on Korean rock music (in English), is posted at the website for the Psyche Van Het Folk programme from Radio Centraal of Belgium. There is an older post on the Key Boys HERE. Catalog number K-APPLE 가 20 on Universal of Korea, released in 1970. Sisters Bae In Soon and Bae In Sook, were better know as The Pearl Sisters from South Korea. South Korea, officially known as the Republic of Korea (Korean: 대한민국), is an East Asian country occupying the southern half of the Korean Peninsula. To the north, it is bordered by North Korea (Democratic People’s Republic of Korea), with which it was united until 1945. To the west, across the Yellow Sea, lies China and to the southeast, across the Korea Strait, lies Japan. The Korean people trace their nation’s founding back to 2333 BCE by the legendary Dangun Wanggeom. Archaeological research shows that the first Korean settlers have occupied the peninsula since the Lower Paleolithic period with territories expanding as far as mainland China and eastern Russia during the Gojoseon period, the first nation established by Koreans. Korea’s history has been turbulent at times with the last emperor of Korea dating back to the age of the Korean Empire. Since the establishment of the modern republic in 1948, South Korea has struggled with the aftermath of the Japanese control (1910-1945), the Korean War (1950-1953), and decades of authoritarian governments, undergoing five major constitutional changes. While the government officially embraced Western-style democracy from its founding, it was not until the December of 1987 that direct and fair elections were held and true democracy began to solidify. The duo were originally introduced as the Kim Sisters by their mother Yi Nanyŏng, who was an actress and singer during the Korean War. It was Bae In Soon who picked up on the idea and after winning a contest at the U.S. Eighth Army stage show managed to enthuse her sister Bae In Sook to become the Pearl Sisters around 1968. 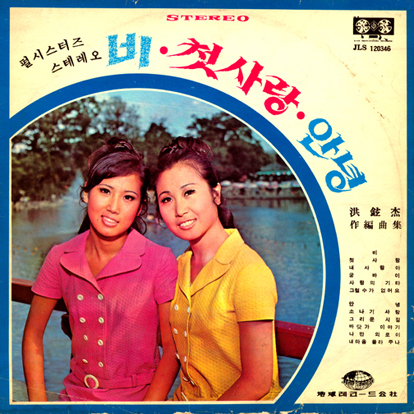 By the early 1970s, the Pearl Sisters were fairly popular, partly because they had the genius of composer – and Korea’s father of Rock ‘n Roll – Shin Jung-Hyun behind them. 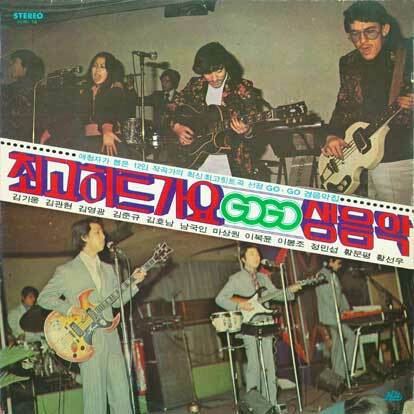 The album ‘My Dear’ (친애하는 1968), named after their best selling song, also included the hit ‘A Cup of Coffee’ (커피한잔). 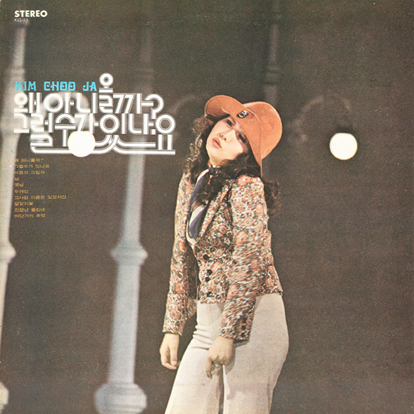 Other albums were called ‘First Love’ (첫 사랑 1969), and ‘Goodbye Rain’ (비 안녕 1970). But, by the mid 1970s the sisters could no longer stand each other, and split. Younger sister, Bae In Sook, continued to sing into the ‘disco‘ era of the late 1970s until 1984. Bae In Soon, re-entered singing in 2004 with a brand new set of songs on her CD ‘A Cup of Coffee with My Song’. Catalog number JLS-120346 on Jigu Records of South Korea, released 1969. The records from that time are very scarce, since they did not press that many. Even today when one of these records are re-issued, there is usually only a pressing of 300 copies. Due to this, there’s not a whole lot of information available about the early days of rock ‘n’ roll in South Korea. 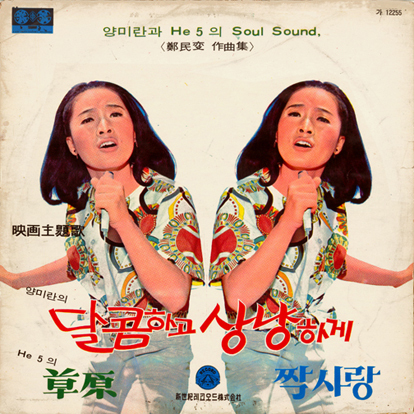 Kim Hong-Tak was one of the two leading figures in the early days of “Group Sound Era”, of course with Shin Jung-Hyun. Kim Hong Tak was guitarist and naturally leader of the group. Here, it seems better to put aside the question ” Who was the first?”. Because with this question of ‘the first’ or more properly ‘the Origin’, the answers will not is the same according to the questioner’s perspectives. For example, if we take one perspective, in this case that of ‘popularity’, it will be the Key Boys of Kim Hong Tak which was followed soon afterwards by the Add4 of Shin Jung-Hyun. A little remark. This Key Boys is not the ‘Later’ Key Boys who sang the smash hits like “Let’s Go To The Seashore”. or “Memories of The Seaside”, but the ‘Earlier’ Keyboys. They played some ‘Package shows’, under the name of the Lock & Key in the stages of the U.S. Eighth Army which settled in South Korea. Also they played at some new venues like ‘Music Listen Rooms’, ‘Live Music Salons’, or the traditional ones like in Cinema. [At that time the concert was held frequently in Cinema Houses. It was called as ‘Cinema Show’]. With these latter acts they were known to general ‘Korean’ public. They were nicknamed as the ‘Beatles of Korea’ – At that time this meant more similar to a ‘cover band of the Beatles’. [Because the stages in U.S Eight Army was for the Korean in the forbidden area for the evident reason of security. So generally a Korean group or artist who played there was a totally unknown figure to general Korean public]. In the mid-60s which prevailed by the worldwide phenomenon ‘Beatlemania’, the Key Boys, in molding the archetype of the Rock band (or Rock Group) who ‘sing and play’ [With the Kkokkirri Brothers, the Fools, the Kim Chies], became the pioneers of a new cultural phenomenon [we may now be able to say that it was the early days of ‘Pop culture’ in Korea]. And here lies one symbolic fact concerning the popular culture in general that 1964-1965, the period of their debuts coincides with that of the birth of the ‘Weekly Magazine’. With the time, the members of the Key Boys left the group: some Cha Jung Rak and Cha Do Gyun going to solos, some Yoon Hang Ki joining to the Korean Army‘s entertainment Unit which was sent to the Viet-Nam War, and finally Kim Hong Tak too. But Kim Hong Tak had launched his career of guitarist in a rock group. It was the He5. Precisely speaking, the He5 was not launched by Kim hong Tak. 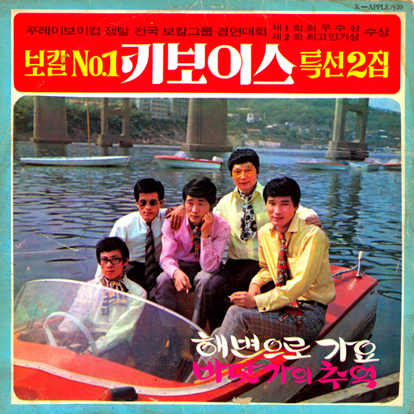 According to the memories of its members, the group was found in the winter of 1967 ‘the five young guys’ all belonged to the Wha-Yange Entertainment Inc. had set up the group together; Han Woong (Rhythm guitar and vocal) issued from the Four Guys, Cho Yong Nam (lead guitar and vocal) from the Shin Jung Hyun and the Jokers, Yu Young Chun (vocal) from the Silver Coins, Han Kwang Soo (Bass) from the Kee Jin Sung’s Orchestra. For the connoisseurs, they were all ‘top-class’ musicians from the leading groups of that time. And in this period Kim Hong Tak was still in the Key Boys. (Cf. Wha-Yang Entertainment Inc. was one of the enterprises who dealt with matters concerning the distribution of musicians and entertainers for the 8th Army of USA.- with the Universal, Dae-Young, Dong IL). 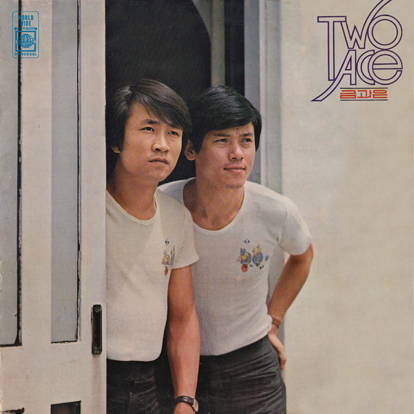 I believe this album may have been a soundtrack, and some of the songs feature vocalist Yang Mi-Ran. Catalog number 갸 12255 Sinsege Records of Seoul, Korea, released 1968. 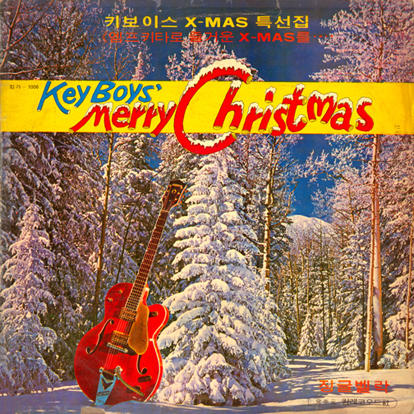 Key Boys were from Korea. The records from that time are very scarce, since they did not press that many. Even today when one of these records are re-issued, there is usually only a pressing of 300 copies. Due to this, there’s not a whole lot of information available about the early days of rock ‘n’ roll in South Korea. The website for the Psyche Van Het Folk programme from Radio Centraal of Belgium has a whole section on Korean rock music (as well as other countires / regions). With these latter acts they were known to general ‘Korean’ public. They were nicknamed as the ‘Beatles of Korea‘ – At that time this meant more similar to a ‘cover band of the Beatles’. [Because the stages in U.S Eight Army was for the Korean in the forbidden area for the evident reason of security. So generally a Korean group or artist who played there was a totally unknown figure to general Korean public]. In the mid-60s which prevailed by the worldwide phenomenon ‘Beatlemania’, the Key Boys, in molding the archetype of the Rock band (or Rock Group) who ‘sing and play’ [With the Kkokkirri Brothers, the Fools, the Kim Chies], became the pioneers of a new cultural phenomenon [we may now be able to say that it was the early days of ‘Pop culture’ in Korea]. And here lies one symbolic fact concerning the popular culture in general that 1964-1965, the period of their debuts coincides with that of the birth of the ‘Weekly Magazine’. With the time, the members of the Key Boys left the group: some Cha Jung Rak and Cha Do Gyun going to solos, some Yoon Hang Ki joining to the Korean Army‘s entertainment Unit which was sent to the Viet-Nam War, and finally Kim Hong Tak too. But Kim Hong Tak had launched his career of guitarist in a rock group. It was the He 5. Catalog number 킹 가 1006 on Universal of Korea. No release date listed.